Learning the bagpipes is not as difficult as many believe it to be in that there are only 9 notes to the scale and the blowing technique does not take too long to develop. The main challenges are learning the embellishments that are used to enhance the theme notes and this does take regular practice. That said, most people are able to play a simple tune on the pipes after a short time. An Advanced Learning Programme has been designed to help and encourage those pipers that wish to progress more formally with their piping. The programme enables guidance to be given on a wider range of music, using more advanced tunes that will not be played by the Band. The study of these tunes will not only improve individual players’ expertise but will ultimately also benefit the Band’s performance. 1. 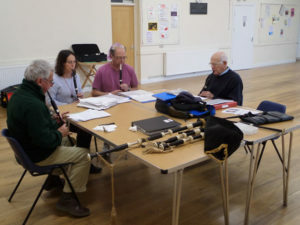 Weekly Band Practice The Band meets weekly on a Thursday evening and instruction is given by the more experienced members of the Band. Individuals receive both personal and group instruction on the practice chanter; practice with the drummers as a full band; and playing the pipes in the static circle and also as a marching band. Even the total beginner is given the opportunity to march with the Band to give them the experience. So, for novice or more experienced piper alike, we have built a structured programme to hold your interest and to promote development at your own pace. 2. Band Workshops The Band arranges non-obligatory day-long workshops every 4-8 weeks or so to enable players to gain the maximum learning experience in a concentrated session of practice. These sociable events are normally held on a Sunday and have proven to be an excellent medium for individual skills development. In turn, these voluntary sessions have greatly improved the overall musical standards of the Band and are sociable occasions where we can all progress together in a spirit of bonhomie. 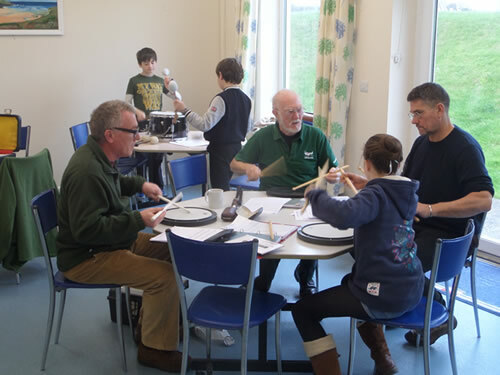 Instruction covers basic and advanced skills practice; revising band tunes and learning new ones; blowing techniques; group and solo playing on the bagpipes and playing on the march. Please contact the Band if you would like to attend a workshop to see if piping is for you. 3. Private practice As with any musical instrument, it is imperative that the individual puts in regular practice to improve playing skills. With the bagpipe it is important to practise skills slowly and regularly to build up good technique which will allow a better platform for increasing speed of accurate playing. 4. Public Performance The Band members enjoy taking their music to the public during the many events that we attend throughout the year. These include participation in events that vary from the absolute formality of the Royal British Legion Remembrance Day Parades in Falmouth and in the city of Truro to the festive atmosphere of local fetes and carnivals. All these events allow the Band to put into practice the skills that have been rehearsed in the Drill Hall, giving learner and more experienced players alike a challenge to perform to the best of their ability. Even the absolute beginners are welcomed to parade with the Band to develop their sense of teamwork and pride. It goes without saying that all feel a sense of achievement when an event has been well performed and there is nothing like the applause from an appreciative audience. We can provide you with a structured learning programme with laid down objectives which can be achieved at your own pace of development. If you are interested in learning the pipes then please do not hesitate to contact us. There is no tuition fee at all!